It all started last week when she was sitting on the counter watching my cook. Then she pulled me over and pointed to Daddy's keys. From there, her vocabulary has exploded. If you ask her to say a word that she doesn't want to say, she'll say: "Go, Go!" or "No!" Due dates are a joke. They told me that Ava would be born on July 17th. She was born on July 27th. They told me that Jaina would be born on May 21st. She was born on June 1st. Both of them about 10 days late. So...why did I have such high hopes for yesterday? 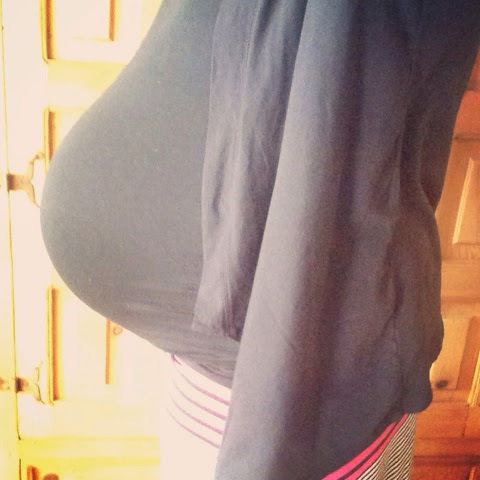 March 27th was Little Mr.'s due date. The day came and went. The Dr. had no news as far as progress was concerned. No change from last week. No more dilation...no effacement. He's just hanging out in there and in no hurry to meet the world. I was in a foul mood. Today, I've tried to focus on the positive things. He's healthy as far as we know. The day will come...hopefully in the next 10 days. Mom is coming next week. This is the least miserable pregnancy I've had. I'm looking forward to Little Mr.'s birthday...whatever day that may be. Sooner than later (I hope). Something better start happening....like now. I used latex enamel house paint for the siding, the inside walls and trim. The shingles are just as they came because I didn't feel like staining them. They're secured with hot glue. The house is glued together with Aleen's Tacky Glue. For the trim pieces I used super glue because it dries and holds quickly. The wallpaper on the inside is scrapbook paper that I secured with spray adhesive. I wouldn't say that this is the best way to paper the walls but it works ok. There were a lot of options out there for furniture and decorations. I spent hours online trying to figure out how to get the look I wanted. Hobby Lobby carries full room sets but the problem with that is that they run from $20 - $50 a room! Not exactly what I wanted to pay and then have to worry that something would get broken. Plus, there would have been way too much furniture crowding the house and I wanted to keep it simple. I saved a ton by making it myself. I already had a bunch of craft supplies like acrylic paint and fabric scraps in my stash of stuff. It's not perfect but I think it'll hold up a lot better to wear and tear. The pink room is Ava's room. I bought the little chair and bench at Hobby Lobby but I made the bed (I'll explain that later), bedding and wall art. The wall art is just a 2x2 canvas. I painted the edges and then printed an image off the computer. I wrapped it in packing tape and attached it to the wall with that rubber sticky stuff. All of the wall art in the house was made this way. I sewed all of the little bed pillows and simple "comforters" for the beds. This next room is Jaina's. The little dresser was a couple dollars at Hobby Lobby and then I painted it. The mirrors came in a pack of three and the little blocks you see throughout the house are just plain wooden blocks that I painted. The airplane room is for Little Brother. The black and white picture is of a biplane that I printed off the computer. The little bench came with the other little bench and chair - all plain wood that I painted different colors. The beds are all made out of unfinished wood pieces from Hobby Lobby. You can get packs of wood pieces for just a couple of dollars. I cut the pieces (with a hand saw) and used Aleen's Tacky Glue to secure the head and foot boards. The legs are unfinished wood finial caps secured with hot glue. The mattress is a piece of quilt batting wrapped in fabric and secured with hot glue. (Have I mentioned that I love hot glue?) To add a little extra touch, I dug through my craft stuff and found some crocheted lace and hot glued it around the edge of the bed. For Little Brother's bed I used bakers twine. I painted everything with the same paint I used for the walls. This is the whole upper level. This next room is the master bedroom. The table and chair came with the kitchen set but I had already made a table so it found a home up in the bedroom. The double bed is just a bigger piece of unfinished wood that I cut and painted and made like the other beds. For the kitchen I bought unfinished chairs and painted them. The table is just another piece of unfinished wood (painted white) with fancy dowel things hot glued on for legs and painted red. The table cloth is just a piece of scrap fabric. I did buy the kitchen set at Hobby Lobby and it's probably the most expensive furniture in the house but each piece has working doors. I wasn't about to try and figure out how to make a whole kitchen set. I love the Dala Horse wall art. "When my baby brother grows up then we'll have two daddies in the house and three mommies to keep the house clean....and one dog that pees on his foot." "Jingle bells, jingle bells, jingle all the way! Oh, what fun it it to ride in a one horse open.....FISH! Hahahaha! I said fish! That's a joke! Haha!" "So now you're gonna have two babies and just one big sister to take care of everything." "Daddy looks so amazing I could just scream!!" "When are we going to Marion's house?" "At 5 o'clock for supper." "Awww, but 5 o'clock is MILES away!" "Ava, I washed all of your sheets today! Do they smell all fresh and clean?" "Haha! Tap look at this picture of you!" "Hmm...I guess Tap doesn't appreciate pictures because he's a dog." "I can't help it! I'm too playful!" Ava has really taken off on her bike riding! It just makes me so happy to watch her pedal back and forth on our dead end street. Jaina wanted to fly an airplane on the computer but I told her she had to wait for Daddy to get home. Ava said, "But how is he supposed to fly with her if he has bacteria in his throat?" Ava tried calling Grandpa Waldo on Facetime and it just rang and rang. She said, "Mom! Robert is not answering the phone!!" She's decided she doesn't ever want to have a baby. Jaina is picking up on a bunch of new expressions. "Jaina, be careful with that book, okay?" "That's your water bottle, Jaina." "Jaina, do you want a snack?" "I, I, I, I yes." "Do you need your diaper changed?" "Jaina, be careful with the door!" "Because you don't want to break it." "I, I, I, I, I,"
This picture was taken last week at 36 weeks. I'm 37 weeks today...I had an appointment but nothing to write home about. 3 weeks seems like a long time. I'm tired and my feet and hands swell sometimes but for the most part I'm good. Except for sleeping...hips and legs ache all night long. Oh, and I. can't. breathe. I'm thankful for cool weather. I hope it stays cool. I hope this baby comes on time.